Americana,colored with and urban blend of Rythm and Blues. 1. What's Up? How Ya Doin? 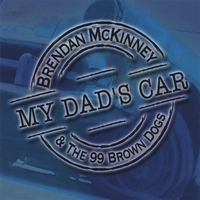 Brendan Mc Kinney was born in and raised just outside the city of Philadelphia. Just like his current lifestyle as a traveling international troubadour, McKinney's upbringing didn't exactly encourage conformity. He grew up in a large Irish family immersed in a world of words and music: his father was well-known journalist/music critic Jack McKinney of the Philadelphia Daily News; his mother Doris Kavanaugh McKinney sang with legendary big band leader Vaughn Monroe, and was a popular Philadelphia area performer . Intermingle those powerful influences with the extensive rock n' roll album collections of his older brothers and sister, and it's easy to see why McKinney has chosen the road less traveled. "Everybody in my family played at least a little guitar and sang", reflects Mc Kinney, " I was the last to pick it up, but I could never manage to put it back down." After many years as a prominent entertainer in the North Eastern region of the U.S., both as a solo artist and as lead vocalist and guitarist for bands such as: ' The Missionaries' (rhythm & blues) and ' Driving Wheel ' (blues). Mc Kinney is recognized a talented songwriter and powerful and exciting stage presence. He has played concerts and clubs in numerous venues throughout the east coast and currently lives and performs fulltime in Colorado. When Mc Kinney is performing live, he constantly reaches for a new plateau, and is arguably most compelling to watch when he cuts loose and improvises with his music and the crowd. He has opened for big name acts such as Chicago blues great Bobby Radcliffe and has performed with the likes of Philadelphia local recording artist Tommy Conwell. Mc Kinney has also been successful at expanding into markets in all of Scandinavia (Denmark, Norway, Sweden and Finland) and parts of Europe (Germany, Austria and Greece to name a few). During this time he has had much success, and has sold thousands of his original CD's at his live shows. He currently has a loyal and ever increasing fan base both in the U.S. and overseas.
" The great thing about playing to international audiences", says Mc Kinney, " is that you get inspired to create and play material you never would of thought about had you not traveled in the first place. Inspiration comes from the places I least expect it sometimes ... these days I do most of my best writing when I'm on the road ." Brendan resides in Eagle, Colorado where he works the bustling local scene in the Vail valley during the winter and summer seasons. He performs regularly at Vail hot spots, The Red Lion and Pepis. Many tracks from this cd have been played on various tv shows such as "justified" "shameless" " army wives"
"United states of Tara" to name a few. Enjoyed almost every song. The more you listen the more you like it. Many songs are very catchy. Lyrics are clever and passionate. Thanks to K Anderson for turning me on to this.